Make a bacon cake for your dog..
Bacon is trendy today. Chefs are creating all kinds of dishes with bacon. There are bacon cookies, bacon donuts, bacon flavored popcorn. Let your pup jump into the bacon celebration. Dogs love bacon. Baking bacon will turn it mushy. Cured bacon is full of nitrites and salt. Although dogs don't suffer from the same types of cardiovascular problems that humans do, you may want to give your dog a healthier alternative. Some bakers prefer just to use the bacon grease for flavoring after straining it. It will keep longer if the fat is strained out through a fine strainer or sieve. Use the bacon grease as you would cooking oil. Other bakers share the same bacon they buy for the two-legged family members. Liquid smoke has also been suggested as an option to get the bacon flavor and aroma. Bacon - your choice: regular, turkey bacon, or nitrate free bacon. Prepare the bacon: bake it for 10 minutes on each side until crispy. Then chop the bacon into small, fine pieces and fry. Save the grease if you desire for straining and using in place of cooking oil. Frost with dog cake frosting. 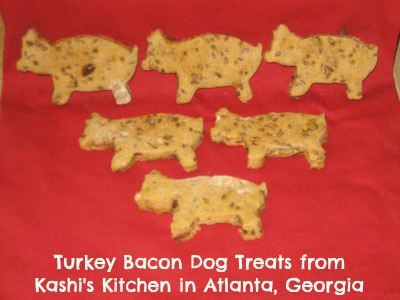 Dog treats from Kashi's Kitchen in Atlanta, Georgia - cute little piggy turkey bacon treats for dogs! You are only limited by your imagination as to ingredients and flavors you can mix in and add. If your pet likes cheese, consider adding cheese or a cheese flavoring for a bacon and cheese dessert. 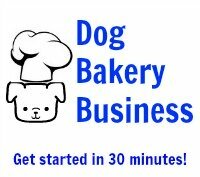 Be sure to browse through the other dog cake recipes on this site to stimulate your imagination and tastebuds. 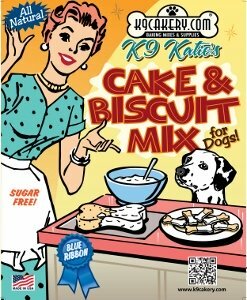 Visit K9Cakery.com for unique baking supplies to make your pet's next birthday a memorable event.